← Your Free SMS Gateway Integration For Grabs! 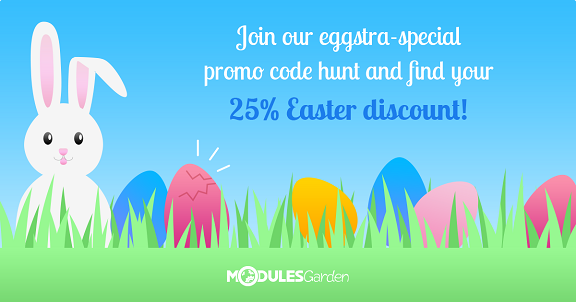 Continuing our annual tradition, the entire ModulesGarden team gathers up once more to wish our dear patrons all the best for the upcoming Easter! May this joyful season of new beginnings supply you with enough enthusiasm and good fortune to last the whole year! To celebrate this special holiday, we created our very own Easter Egg Hunt. Join in, have fun, and win a fantastic 25% discount to spend freely on any product on our website! Find one of those hashtags and put them in the comments section below. The first hunters to submit a unique code will be awarded a 25% discount on each annual license on our Product Marketplace! The promotion officially lasts until the end of 23rd April 2019, and the winners are to be announced on 24th April 2019, around 9AM CEST. Important: each person can provide a single hashtag only. Once submitted, hashtags cannot be used by the next participants anymore. The promotion covers only social media posts published prior to 16th April 2019. No time to waste while such egg-cellent prizes are waiting to be found. Make a fast travel through our social media profiles and be on the close lookout for the Easter promo codes! Go on a Facebook hunt!Go on a Twitter hunt!